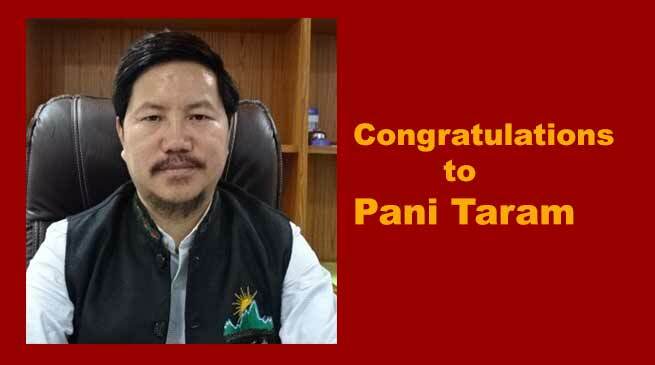 One of the Arunachal Pradesh lawmaker and 21- Koloriang MLA, Pani Taram have been selected to be awarded as “Adarsh Yuva Vidhyak Puraskar”-2017 by Bharatiya Chhatra Sansad at Pune in Maharashtra on January 20 next. The organisation Bharatiya Chhatra Sansad Foundation (Indian students Parliament) in its communication have said that selection process was made in 12 states of the country out of which twelve lawmakers have been selected and out of which Taram have been selected for his activities apart of two other from the region. The BCS and MAEER’s MIT School of government, Pune in its 8th national conclave on January 19 to 21 will confer the award which contain grand citation, shawl and trophy as a token of appreciation and honour. “Castesim in Indian Democracy : Problems & Prospects.”. Assam Assembly Speaker H.N Goswami, Senior Leader Dr. P. L. Punia and. Naresh Agrawal would also share dais along with other Ideal MLA, Dambaru Sisa from Odisha will be there. Chief Minister of Maharashtra is the Chief Patron & BCS is supported & Endorsed by across Political parties, Union and state Governments, International Orgnizations like IPU, CPA, UNESCO. Arunachal Pradesh former Speaker Nabam Rebia had participated in BCS and Kiren Rijiju also visited.